CalPERS has yet again confirmed its preference for cronyism and convenience over good governance. It changed its election procedures in 2016, resulting in a process that violates both the California constitution and specific election statutes. It is already troubling that CalPERS, a state agency, also administers the elections for its board members. Unlike state and local governments, where elections are a major element in their activities, elections are an afterthought for CalPERS, and it shows. Last year, CalPERS changed ballot procedures, turning a formerly secret voting process into one that makes how participants voted visible. As we will describe, it also may be possible for the vote-counting process to be exploited to the advantage of incumbents and organizations like unions that have the resources to get out votes. Even worse, in this election, CalPERS has also implemented voting by Internet, which is explicitly against the law in California. Elections for two board seats, with the winners serving as officials of the State of California, are now underway and will conclude on October 2. CalPERS changed the procedures for this election that effectively ended secret voting for ballots sent by mail, which is how the overwhelming majority of responses will be filed. This has reduced the process to standards below those of countries like Syria that the US regularly criticizes as being undemocratic. 2. Once the signature is verified, it is separated from the ballot. The ballots contain only votes and no information about the voter. Yes, sports fans, the signature of the voter is right there for any interested party to read. And in case you thought that having an illegible signature might protect you, the bar code on the ballot must be specific to the voter if it is to prevent vote fraud. That implies votes can be tied two ways to individual voters. As you can see, the ballot shows the vote only. Marked ballots shall be returned to the location designated by PERS in the postage paid return envelope provided by the System, or another comparable envelope, and the reverse side shall be signed by the voter certifying under penalty of perjury that the voter is eligible to vote in the election; otherwise the ballot shall not be valid. 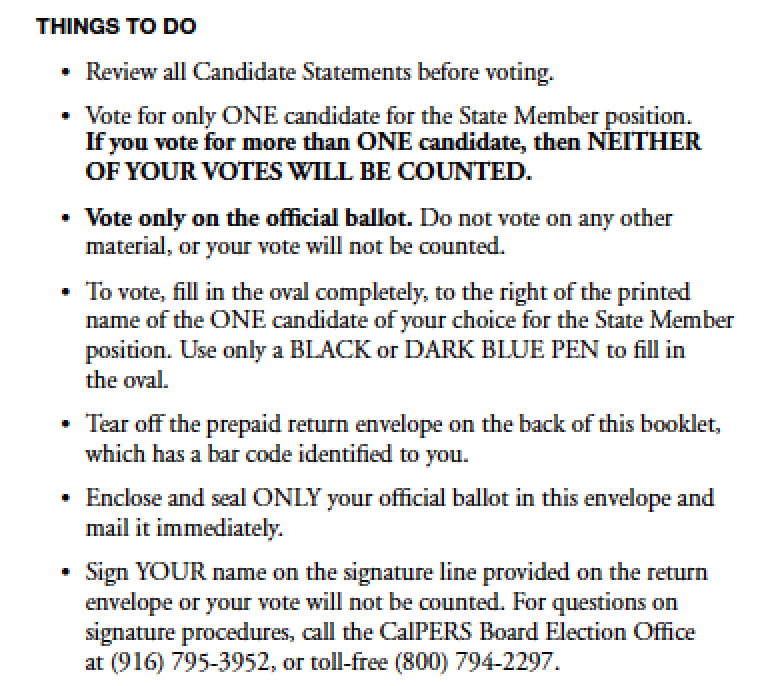 …Paper marked ballots shall be returned to the location designated by CalPERS in the postage paid return envelope provided by CalPERS, or another comparable envelope, and the ballot shall be signed by the voter certifying under penalty of perjury that the voter is eligible to vote in the election; otherwise the paper ballot shall not be valid. You will note that the regulation is silent on the matter of where the even more important identifier, the bar code, appears. It appears that staff took advantage of the ambiguity and moved the bar code, along with the signature, to the ballot proper. Anyone with an operating brain cell will recognize that this is no longer a secret ballot. At a minimum, a person with a legible signature will have their name clearly identified with their vote. Moreover, in many, if not most, jurisdictions, voters sign books at their polling stations when they vote, and the election workers compare the signatures with the ones they have on record to verify identity. So a signature alone can identify a voter. And recall the Secretary of State’s instructions for absentee ballots: the signature is an identifier. In practice, the machines are meant to buttress the (inaccurate) perception that the government not only knows you, but also who you vote for…The device preys on well-founded fears of retaliation against opposition voters. Now CalPERS is not Venezuela, but the agency has a long-standing history of unions using their muscle in campaigns. The reason CalPERS went to an exclusively mail-in voting system in 1994 was due to union abuses. 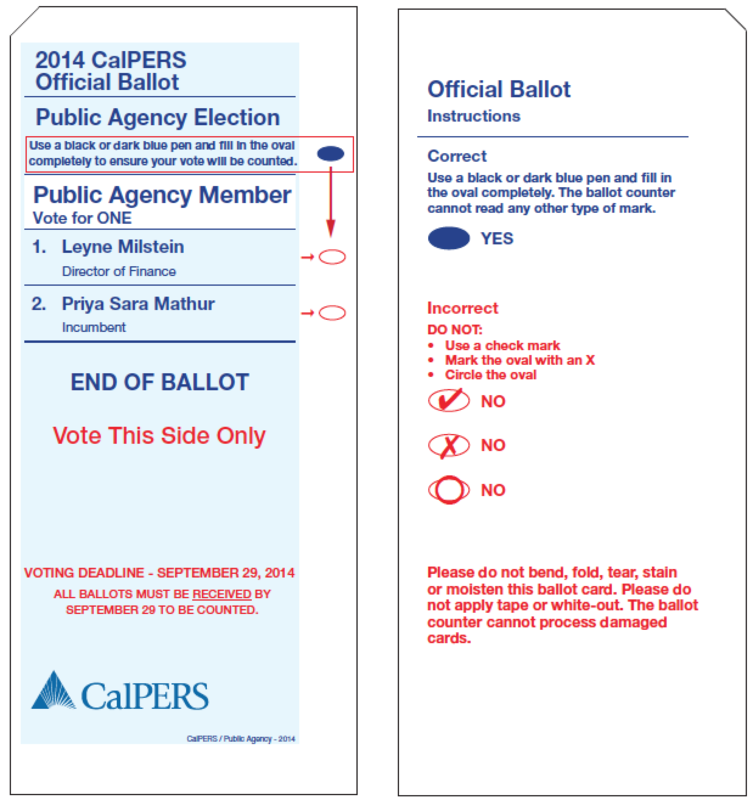 Before, ballots for CalPERS elections would be distributed to government employees at work. Union officials would be on premises that day, telling members how to vote. Operations Support Services Division Chief Kim Malm: ….the signature is on the ballot only for the purposes to validate that there’s a presence of the signature. Okay. So you could sign XXXOOO, and it would still be valid, because we do not have a signature database of our membership to validate it against. It’s just there to acknowledge it’s on the perjury statement, that you have seen the perjury statement and you have done something on that line to acknowledge that you’ve seen that. The data regarding the member is stored in the bar code on the ballot, just like it was – just like it is currently. And the data that’s stored on there is just demographic data that the Board gets, reports on after the election, age, employer, gender. The information that is captured is only that the person voted, not that the person – or not how the person voted. And so we need to have that information in order to ensure that somebody doesn’t vote more than one time. But that information, again, it’s all captured by the third-party vendor. It is not – it is not here. We have no access to any of it. But again, all they’re capturing is that the person voted and not how they’re voted – or not how they voted. The IVS everyone counts ballot facility is certified by the California Secretary of State. In addition, they process – they audit their processes every two years with a third-party vendor. This is disingenuous. First, as we indicated, a legible signature will identify a voter. Second, the idea that the bar code contains only demographic information cannot be accurate if CalPERS is to be sure that there are no duplicate votes cast. Either the process is ripe for fraud via duplicate votes or the bar codes are specific to each voter and hence can identify how each CalPERS member voted. It is thus reasonable to assume that each bar code number is unique to a particular voter, otherwise the election cannot have any integrity. When I asked the question about watching the vote count I was told it took place in Washington over a period of time. I was left with the impression they would count before the October 2nd voting deadline. This would suggest that votes are actually being tallied, as opposed to envelopes being counted but not opened until the election period was over. Why is this particularly troubling? For both board seats, this campaign features a sharp split between reform-minded candidates, Mike Flaherman and Margaret Brown, both of which have been endorsed by retiree organizations, versus the union picks, David Miller and incumbent Mike Bilbrey. Note that retirees vote at proportionately higher levels than current employees and historically have accounted for most of the votes. However, the unions have infrastructure to get out their votes. Another factor to keep in mind is that CalPERS staff has abused election procedures to favor incumbents1 and also aligned with unions against reform efforts. For instance, Governor Jerry Brown attempted to change the criteria for the board members that the governor designated to sit on the CalPERS board. His intent was to increase their expertise and allow for better oversight. CalPERS staff and the unions succeeded in stymieing Brown. It is bad enough that the ongoing logging of ballots prevents independent oversight. One way this process could favor one side is if it were given information about running vote totals. If it were behind, it could engage in more concerted “get out the vote” efforts to try to reverse a possible loss.2 The unions have the infrastructure and information to contact their members, so this sort of information would be particularly useful to their candidates. CalPERS does offer other methods of voting, via the Internet and phone. It is difficult to see how a vote by phone would be secret. In addition, this is the first year that CalPERS has provided for online voting. No part of the voting system shall be connected to the Internet at any time. It is hard to understand the CalPERS process as a secret ballot. Have the Secretary of State and Attorney General weighted in on this? And if not, why not? If CalPERS can’t be bothered to conduct elections that conform to California law, then the Secretary of State needs to step in and operate them until CalPERS demonstrated it is willing and able to comply. I hope CalPERS beneficiaries and California citizens will demand answers, since taxpayers ultimately backstop CalPERS pensions. Please e-mail or call these state officials, since the Treasurer and Controller also sit on CalPERS board. Please cc your Assemblyman and Senator for any messages you send (contact information here), and to the editor of your local paper. Past experience shows that e-mails and letters from Naked Capitalism readers have had an impact. Again, thanks for your interest and help! 1 In the 1998 board election, Jim McRitchie opposed incumbent Bill Crist. At that time, candidates submitted a ballot statement by a set deadline that would then be printed in the election booklet mailed to all eligible voters (there was no amendment or addendum process). McRitchie provided a hard-hitting statement laying out shortcomings in Crist’s performance. Crist pressured staff to let him revise his statement after the deadline to address McRitchie’s criticisms, a clear violation of election procedures. In other mail-in elections, the Registrar lets us know who has returned their ballot. Thay way we can track and focus our “get out the vote” on supporters that have not mailed them in. But in no event are the ballots opened and counted until election day. Another issue is that I cannot find out who gets a ballot. As a candidate in any other public election in California, you can request the voter data and history file. This way you can target high propentsity voters. CalPERS regulations prohibit the release of any member’s information. So as a candidate I have no idea who is voting or even if they should be voting. No way to check the rolls. This entry was posted in Banana republic, CalPERS, Legal, Politics, Regulations and regulators on September 13, 2017 by Yves Smith. CalPERS has a history of violating California open meetings laws. 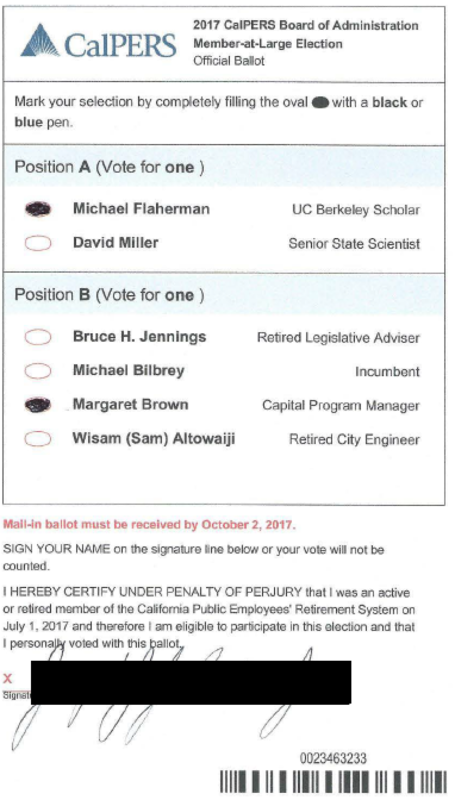 Now CalPERS is running an election in violation of California election laws. This reads like 1890’s machine politics. Thanks for your continued CalPERS reporting. Great stuff. I supported a campaign for a pension board in MA, where the candidate was endorsed by groups representing about 10% of the electorate, and yet she only got ~5%. Those were also not secret ballots and there was no way whatsoever to audit the vote. A former city councilman told me that “CalPers thinks they’re immune” from laws and regulations. He should know: his wife spent the better part of 30 years as the chief aide to a state rep and later statewide official. ….the signature is on the ballot only for the purposes to validate that there’s a presence of the signature. Okay. So you could sign XXXOOO, and it would still be valid, because we do not have a signature database of our membership to validate it against. Um…if putting a couple of Xs on the line is acceptable, why ask for a signature at all? why not just have a check box with next to the perjury clause with “I have read and understand” or something like that? And, it seems passing strange that the signature doesn’t even serve as protection against fraud, at all since they’ve got no way to validate them. So someone could steal the ballots, fill them out and put a XO in the signature line and send them in and CalPERS would have no way of knowing that they were fraudulent. It’s almost as if their not interested in security at all….just sayin’. Yikes. Using Third World illegal election procedures to pick the board for the second-largest pension fund in America isn’t a good look. What a terrific Poison Pill that CalPERS management have baked-in to this election! If the union-backed candidates lose, the seat previously occupied by the only Board of Administration member with an operating brain cell, JJ Jelincic, will be tied-up in litigation. As a CalPERS beneficiary, I was and am a strong supporter of organized labor — but the unions are so blinded by their “duty” to hold the line on rate increases that their current members are likely to be left holding IOU’s when it’s time to retire, waiting for a bail-out that the second-tier PEPRA members will never agree to fund. There ain’t no Santa Claus! This is a real horror story. Good election systems should be designed in such a way that they will honestly reflect voter intent, and the CalPERS elections fail on so many counts! That said, I was a little shocked to read “Now CalPERS is not Venezuela”. Venezuela actually has possibly the best managed elections in the world. Yes they are electronic but 51% of all the paper ballots are examined to ensure accuracy with machine totals. And when there are problems something is done about it. Venezuela leaves USA elections procedures behind in the dust. An interesting fact is that, as per a lengthy personal conversation with Greg Wilpert, while in USA hand-counted paper ballots can be ideal in the few places where there is genuine secure chain of custody of the paper ballots, in Venezuela paper ballots were historically the most problematic thus the system was changed to electronic (using its own system) with rigorous auditing. You are misrepresenting what I wrote. I suggest you read the Atlantic article. The use of fingerprint scanners and the way they are deployed in polling stations are consistent with a tightly controlled system, but many citizens interpret them as allowing their votes to be connected to them, as in a lack of privacy. I have refused to give any biometric information to the government and would be extremely unhappy with a system in the US that required me to supply my fingerprints in order to vote. Yet you can’t see that as very problematic? Given the history, the electronic voting is regarded with skepticism. And it remains that paper ballots, hand counted in public, are the world standard for open and fair elections. Any system using machines has greater potential for mischief. I too dislike electronic voting and also biometric scanners. However–the Atlantic article you reference is typical anti-Venezuela propaganda, filled with outright disinformation on almost every topic it mentions. “The Media on Venezuela: Double Standards and First Impressions” is a recent thoughtful discussion about this issue. I’ve observed Venezuelan press for many years, particularly since the Irish-filmed documentary of the US-sponsored coup attempt in 2002. Venezuela is not perfect and has serious problems of its own creation, but many of its worst ongoing problems–and obstacles to solving them–are thanks to internal powerful wealthy minority and generous funding from outside actors such as the USA and others. Venezuela’s sizable fossil fuel reserves pose a threat, but even more of a threat is that the government has despite obstacles continued to do such much to improve the condition of the people, and to include them in decision-making. For some reason the actualities of Venezuelan democracy–which leave the USA in the shade–are not discussed by the states trying to destroy Venezuela. Greg Wilpert brought home to me that the “ideal election system” is different in different countries, and cannot be considered without understanding of the political realities on the ground. In Venezuela, he told me, the paper ballot stuffing and irregularities were so widespread that a paper-based system would guarantee a fraudulent result (they used to have the kind of 98% victories like we see in dictatorships). I was impressed to learn about 51% of the actual paper ballots being hand-counted to ensure that machine vote totals were accurate. Would that we had such a commitment to accurate vote-counting in the USA. Lastly, you mention hand-counted paper ballots as “the gold standard”. Here’s the problem with your statement. This “gold standard” is only as good as the chain of custody of the ballots, and to them being used for the actual counting under public scrutiny. Unfortunately, even in the few places where paper-ballots are hand-counted, in the USA there is little or no chain of custody of ballots. Bev Harris filmed the transgressions in NH in 2008, to name just one educational example. In another video, Black Box Voting filmed a van driving marked ballots, and ballot-remarking devices revealed in the van. There’s a good analysis of the problems with NH elections, including links to documentation, here. Broken chain of custody is only 1 of 6 serious problems mentioned. And NH is a state which is “good” compared to many other states! (They have more of those “gold standard paper ballots”.) Election systems have many complex moving parts and comparison of systems (e.g. Venezuela and State of your choice) should be done from the basis of the full system including checks and validations. Shorter answer–the Atlantic article is a classic example of what leads to the widespread misperceptions of Venezuela. Your response is basically an ad hominem attack on the Atlantic. It does not address the issue that the Atlantic raised and strikes me as commonsensical, that the use of fingerprint scanners creates the impression that the ballots are not secret. Secrecy is voting is of paramount importance, arguably even more important that integrity of the count, since people believe they could be punished for their vote and therefore either will not vote at all or will vote what they think is the “approved” way. Yves, it sounds like you did not read my long response, nor look at the links which demolish the “facts” anti-Venezuela propaganda of the 2013 (!) Atlantic article you cite. Nor did you address the fact that in Venezuela 51% of all ballots are hand-counted to audit (far superior to US elections). The Atlantic article was vague in terms of how the scanners were used in elections–it does specifically mentioned them being required for social welfare benefits. As I indicated, I am not in favor of biometrics and agree 100% with you that the secrecy of the ballot is crucial for election systems. Nor am I in favor of Venezuela having a barcode on (some?) ballots, as is also used–illegally–in some USA elections. Since virtually everything the Atlantic’s lengthy piece has to say about the Venezuelan political situation is false (per my links and more to follow), I would not consider the Atlantic a reliable source on Venezuela-related matters. Much of the disinformation comes from omission (for example they never mention that almost all Venezuelan media is owned by the opposition). For example, are those scanners used for all voters? Or just for voters who can’t sign their name? If the Atlantic has not provided consistently deliberately misleading information throughout the article–information proven to be false–then I’d recommend also not relying on them for any information about Venezuela’s election systems. Note specifically that the disinformation in the article includes “information” about Venezuela’s elections which is simply incorrect. A couple more up-to-the-moment articles after I posted: Mark Weisbrot interview on TheRealNewsNetwork and a short documentary made by ” diverse group activists and media professionals from the United States, Australia, Zimbabue and Belize”. The anti-Venezuela propaganda coming from USA, EU, and USA-aligned Latin American countries is extreme and prolonged–decades–ever since the oil elite lost power. Don’t fall for it. The links provided from diverse sources were an opportunity to educate yourself about the extent to which you have been misled. I did read your comment. Everything is off point. You keep trying to attack the Atlantic as a source. You have yet to provide an iota of information that disproves what it says about the use of the fingerprint scanners in the elections and the effect that has on some voters, that it intimidates them. You need to rebut the remark I made. You haven’t. Instead you keep raising irrelevant issues to muddy the waters. More generally, you ignore the fact that we have published links that are generally favorable to Venezuela. However, most Venezeula backers display the classic halo effect cognitive bias: Maduro have made some poor political and economic choices in recent years which their fans on the left gloss over. Did you miss that Maduro has suspended Constitutional rights, for starters? That isn’t US government propaganda, that’s a verifiable fact. The left acts as if all leftist governments must be unconditionally defended, no matter how authoritarian and corrupted they become. In acting this way they hark back to the Stalinist days of unconditional allegiance to the party, or to the Cold War years when even timid critiques to the left—even within the left–produced knee-jerk attacks and excommunications. The left has failed to critique a “leftist” government whose policies have led to the current crisis in Venezuela. It took Noam Chomsky ten years to realize that Chávez has become a dangerous authoritarian ruler who betrayed the grassroots movement born out of his initial emergence into the Venezuelan political scene. Slavoj Zizek is careful to remind us that Nicolás Maduro and Hugo Chávez are authoritarian caudillos not be compared to Pablo Iglesias from Podemos or Alexis Tsipras from Syiriza. But Zizek is reluctant to use his acumen to shed light on Venezuela’s darkest hour. Venezuela was news while it was good news and while Chávez could be used as a banner for the left and his antics provided comic relief. But as soon as the country began to spiral towards ruination and Chavismo began to resemble another Latin American authoritarian regime, better to turn a blind eye. If I may opine… the biometric drama seems an intrusion on – personal – privacy tho on a voting issue democracy demands an open, transparent and accountable roll call e.g. we can see the intrusion by means of money equals votes i.e. endless transition to keep influences private. This is made somewhat moot by the machinations of the market over sometime e.g. everything you do has a finger print. disheveled… in the Venezuela account theirs is a long history of outside influence and we all know neoliberalism is anti democratic.